National Safe Place (NSP) Week is celebrated nationally during the third full week in March each year. This recognized week honors Safe Place, an outreach and prevention program for youth in crisis. NSP Week serves to recognize the many valued partners who work together to provide immediate help and safety for all young people. It is a dedicated time to acknowledge licensed Safe Place agencies, Safe Place locations and community partners and volunteers. These individuals and groups are the pillars of strength that support the national safety net for youth. 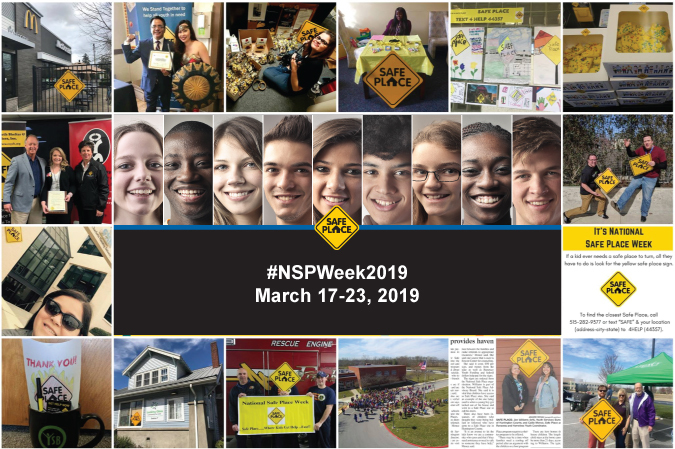 This year, NSP Week will be celebrated March 17-23 (#NSPWeek2019) nationally. Want to help spread the word about Safe Place? Become a Safe Place supporter. Want to get involved to keep youth safe? Click here to learn about various ways to get involved in the Safe Place effort.